the thrill of it all - moments of joy in the wedding chaos: Andrew Chapman 'Nearly a Retrospective', Burrinja Gallery, Upwey. Andrew Chapman 'Nearly a Retrospective', Burrinja Gallery, Upwey. 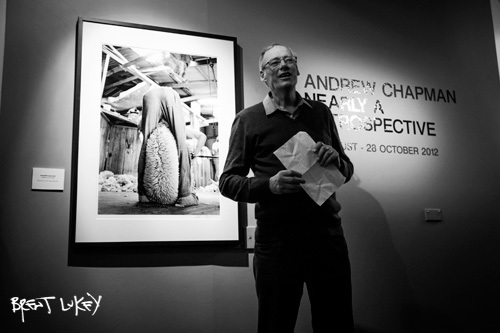 Remarkable Australian photographer Andrew Chapman has an exhibition on right now that is too good to miss. The show, called 'Nearly a Retrospective' is on at the Burrinja Gallery in Upwey. The stunning black and white prints display over 40 years of work as a photojournalist and documentary photographer. Politics, Australian history, working people, farm life, city life and more are covered with pathos, dignity and humour. Don't miss it! Yes it's free.